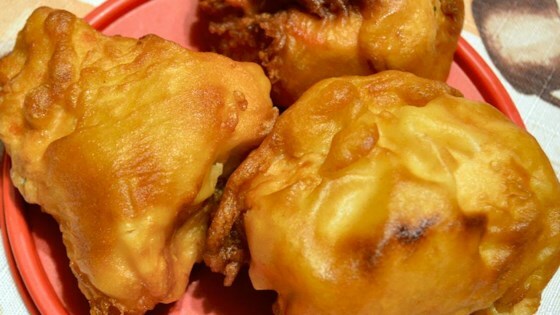 "Easy to make, beer battered, deep fried chicken." Rinse chicken, and slice into 1 inch strips. In a medium bowl, stir together 1 cup flour, and baking powder. Mix in the eggs and beer. Heat oil in a deep heavy skillet to 375 degrees F (190 degrees C). Place remaining 1/2 cup flour in a small bowl. Coat chicken strips in flour, then dip floured strips into the batter. Fry a few at a time in hot oil, turning once, until coating is golden brown on both sides. Remove, and keep warm until serving. I used this batter for shrimp in my Fry Daddy with the additions of garlic and onion powders and cayenne pepper. A nice Asian dipping sauce helped to make this a great appetizer! Thanks Nathan!